Essar Enviro Air Systems, Leading Mobile Maize Dryer manufacturer and supplier and also a exporters of seed coating machines and dryers for the agricultural and commercial food processing industries. Our Company has been manufacturing seed coating machines and dryers since 2007 and is well known around the world for its high quality and durability products manufactured in Hyderabad. 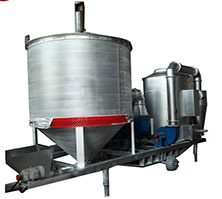 We are mainly focusing on designing and manufacturing strengths grain dryers and food processing dryers. Essar Air Systems is the proven market leader in India for continuous flow and stationary and mobile dryers for feed and food items like corn(maize), vegetable seeds, oil seeds, pulses, grains, rice, mustard seed and other types of seeds. Even though our dryers and seed coating machines are particularly suited for all types of grain seeds and pulses.